Wav is a lossless audio file format created by Microsoft. Today it's a standard PC audio file format for everything from system and game sounds to CD-quality audio. Wav can be played by nearly all Windows applications that support sound. WAV files are considered to be of highest quality sound. The only but quite considerable disadvantage is it's size. An average WAV file is five times more than MP3 in size. No wonder that MP3 has become de facto standard for lossy audio encoding. Certainly the quality of sound will be lower but still not terrible. You gain space at the expense of quality. Converting wav to mp3 is worthy of it. Just imagine. You can have the whole album on your flash card instead of one song! If, on the other hand, you need to create an audio disk, you will probably need to convert MP3 files back to WAV files. Standard CD burning software won't always be able to perform this operation, but Total Audio Converter will always help you. To edit audio files, extract a fragment or add a special sound effect, you will also need to have your audio in WAV files. If you have them in MP3, you will need to convert them. 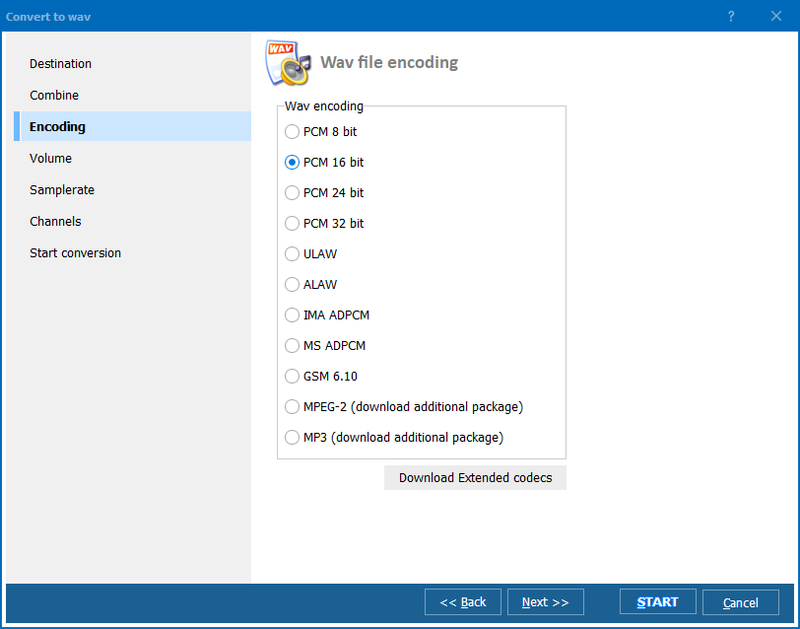 Converting WAV to MP3 or MP3 to WAV is an easy thing if you use Total Audio Converter. This handy converting utility allows to easily convert MP3 to WAV, converting channels (stereo to mono) or changing bitrate or frequency. Total Audio Converter has batch converting option. That means that it doesn't matter how many files you are going to convert; 800+ files will get converted as easily as just one file. Besides all this, Total Audio Converter will play both WAV and MP3 files for you when everything is done. Also, Audio Converter may be run from the command line allowing for use in batch files or can be launched from within other programs. Buying Total Audio Converter you actually get not a single WAV to MP3 converter, but a set of them. 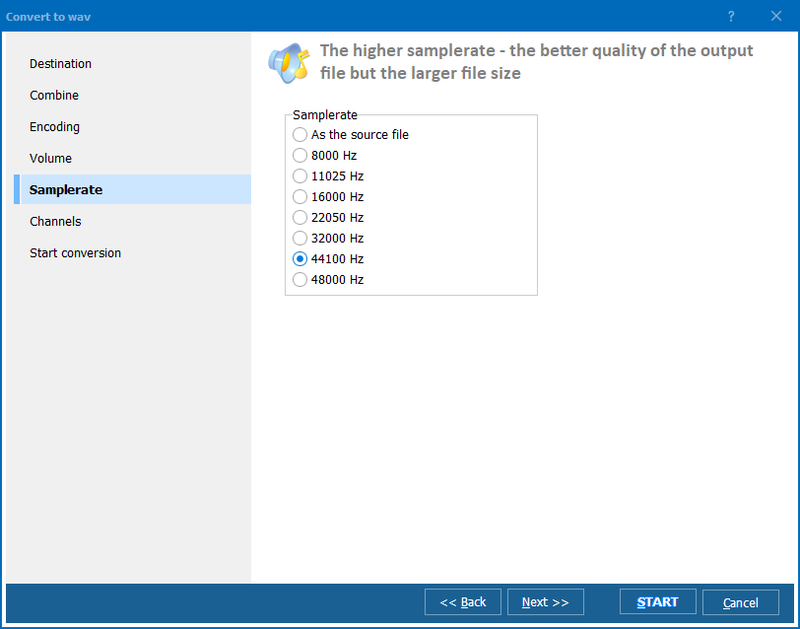 Total Audio Converter converts any audio file to another size/type. The following formats are supported: MP3, WAV, OGG, CDA, APE, APL, MPP, WMA, FLAC, ACC, RA, RMM, RAM, RAX, RPM, RM, MPP, MPC, MP+, RMVB, MP4. According to consumer tests, it is the fastest and most affordable audio file converter currently on the market. Try it for free (trial period is 30 days) and buy for $24.90 only here. Our users say: I own two other audio converter programs that are very limited in audio files and must separate matching files in order to convert to mp3,wma,audio etc. CoolUtils has the best program available! I no longer have to separate my audio files to matching files ex. mp3 with mp3 in one folder. This is what I do, I have a folder filled with mixed audio files ex. mp3,audio and wma. Do I have to separate these files hell no! 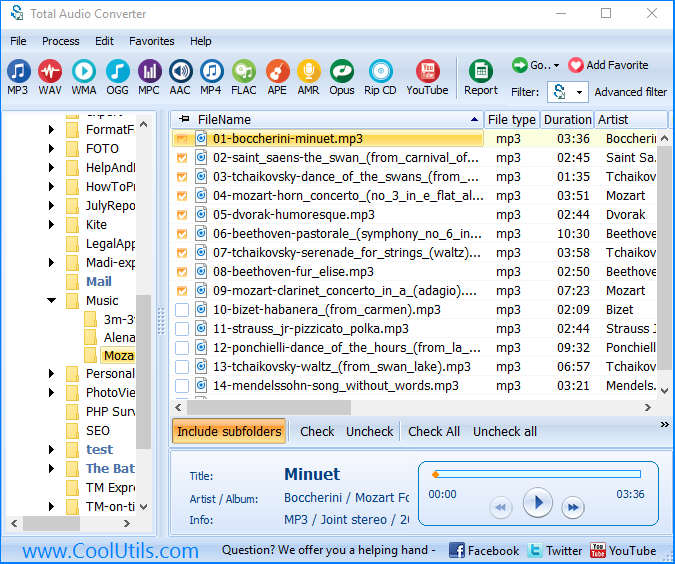 highlight all the files and convert them to mp3 or of your choice. That's some cool lick a dee split! I highly Recommend it.. Must Have program!